Drywall damage is a common occurrence among homeowners. When it comes to drywall repair and drywall ceiling repair, should you do the repairs yourself or hire a drywall contractor? To answer these questions, consider the following. When you want the repair to look seamless. A drywall repair that is not seamless does not matter much in areas of the home that guests probably will not see, such as the garage or a closet. However, a drywall repair in a prominent area of the home, such as a living room or kitchen, will be noticeable if not done correctly. Professionals can make any drywall repair job invisible. Water damage. 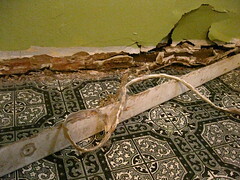 When you have a burst pipe in the wall that turns your drywall into mush, call a professional to conduct the repairs. A drywall contractor knows exactly what parts of the drywall to cut out and replace. Otherwise, you may find mold growth and structural weakness extending to other parts of the wall. You do not know how to repair drywall damage. If you do not have drywall experience, take lessons from your local hardware or home improvement store before repairing drywall or drywall ceiling damage in your home. Or hire an expert. There is drywall damage on the ceiling. Let someone who is licensed and bonded get up on a ladder to do repairs on your ceiling instead of risking injury. Another good reason to call in professionals for this kind of job is that drywall contractors know how to repair ceilings so that the materials do not come crumbling down at a later time. Do-it-yourself projects are satisfying and rewarding. There are times, however, when you should leave certain repairs to the pros. If you’re looking for an Oregon contractor, Sitka Projects is a Portland, OR remodeling contractor that provides countless handyman and repair services, including drywall repair.